In the past few years, I don't know why, but I don't embroider much on my Pfaff. 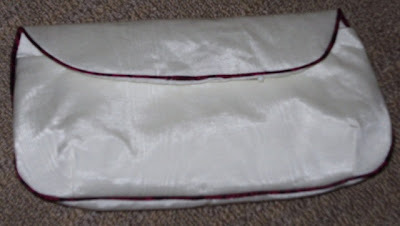 It sews a mean straight stitch which I use daily. 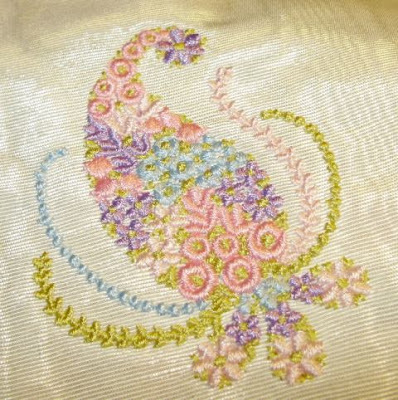 Well, a few embroidery opportunities came up lately and I did these embroideries in the past few days. 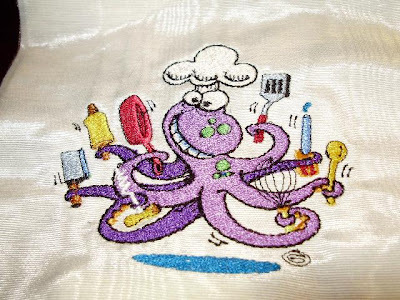 This little kitchen octopus is what the auction winner chose for her custom embroidered chef's apron. This is just the sample that I stitched out to make sure I had the colors right. This weekend, I'll stitch this out on the apron with the name of the cook. 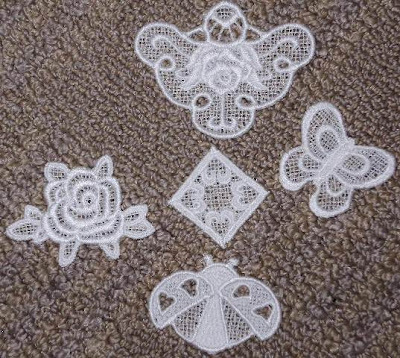 These little embroideries will be perfect focus pieces on my future crazy quilted pieces. I loved doing these today and there were very few floating threads on these designs. This topiary is 2 inches by about 3.5 inches.. This little heart is about 2 inches square. Where did that little black thread come from.. Gesh. These 2 little pieces are the same. I used different fancy fabrics to stitch them out on. I love the soft colors. This is Bluey. He is a little blue webkin that belongs to Grace. Grace let Bluey come stay with Grammie for a few days. Grace called tonite to see what Bluey has been up to and to see what I made for Bluey. I don't have a picture of the little coat I made for him, but I'll show you tomorrow. 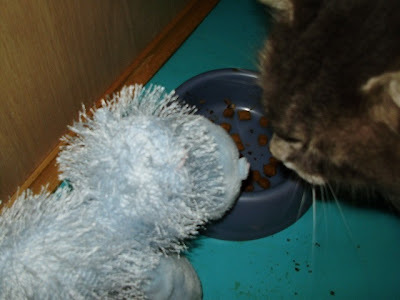 Bluey is introducing himself to my cute kitties. 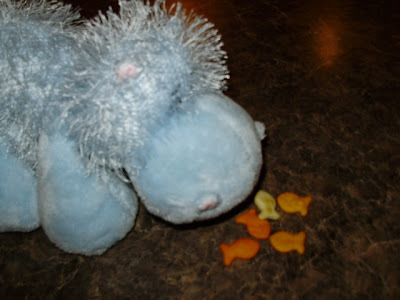 Here is Bluey having a snack.... Shhh, don't tell Caitlin. 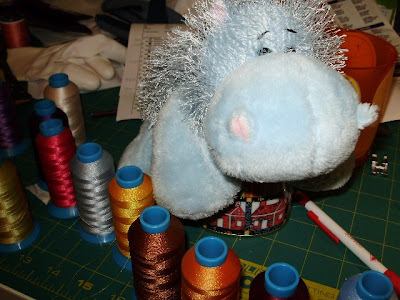 Bluey is picking out his favorite thread colors for his coat. 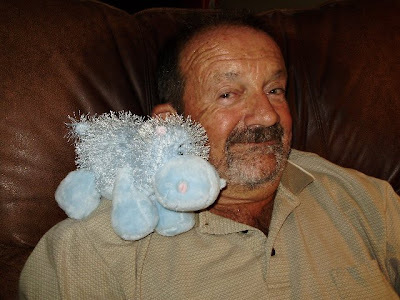 Bluey is reading the TV news with Grampie. 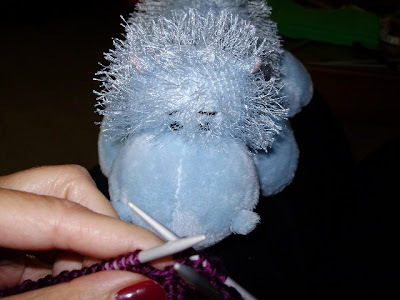 Bluey is watching Grammie knitting Baby Aurora's tart hat. 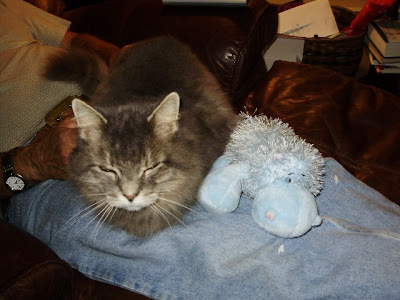 And finally, Bluey is tired so he's having a nap with the kitty. The storm took a right hand turn as it entered the bay of Fundy and therefore, we got rain, but not the big winds that were called for. It's ok to prepare for worst and hope for the best. The warm temperature is nice, even though it's misty today. I finished Patience's green wig. It was a little complicated around the bangs and back where the decreases are. I tried it on and don't you think I look fabulous. It'll be a hoot when she wears it to her shop on Halloween. 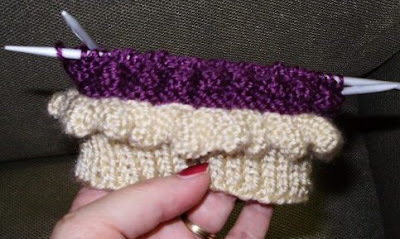 I also started Baby Aurora's tart hat. The bobbles are a little harder than I thought. It's the decrease bobble stitch that got me. Knit 3 together is so tight... I can only get about a milimeter of my knit kneedle to go through all the stitches. Every one is a fight. So, I'll take my time with this one. I got a round of bobbles done then I had to put it down. I'll do a round of bobbles each evening..or maybe ever other evening. They're hard. Well, it's Sunday morning, and I'm working on Caitlins Halloween costume. She's going to be dracula, so I'm making a great sparkly black cape with a red lining. We cut out the fabric with my electric scissors on Thursday. So that means it's easy for me to pickup and sew the cape together. According to the weatherman and this satelite, we're getting a tropical storm tonite. So Mert went to the cottage by himself to prepare for a big wind. We have lots of light stuff on the deck there and we would be wondering how it fared out, so he said the heck with it, I'm going down. It's only an hours drive. So I stayed back and will sew some of my little project today. This afternoon I'm meeting with Rose, the lady from the church that I sew quilt tops for. She's the lady I deal with on behalf of the group of about a dozen quilters at the church. I sew a top every winter for them... and they quilt it and give it to the CWL to sell tickets on. Last year, I did the Burgoyne Surrounded quilt for them. I'm planning on going fabric shopping on Tuesday so I went to see these quilters on Thursday afternoon to show them various choices that I could make for them. But Rose, the head marker, wasn't there. So I'm going to see her this afternoon. She's the ringleader. She's a sweet very french lady who I've been dealing with for 7 years now. I think they are going to go with the Nines and Vines pattern that I showed you last week. I really want to make that quilt. 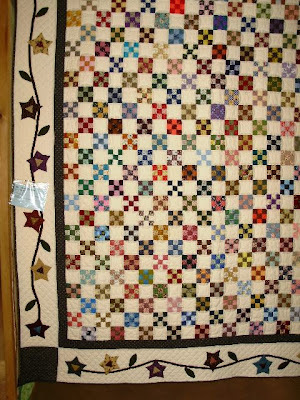 I may get to see the Burgoyne quilt that I did for them last year. I think they will start to sell tickets on it early in October, so I think Rose is binding it now. I really enjoyed my week 2 class of Crazy quilting. This week as homework, I added several pieces of trim and added rouching. So this week, we learned basic stitches such as buttonhole stitch and feather stitch. I added the buttonhole stitch here, but I should not have used light thread. I think I'll take it out and use a darker thread. 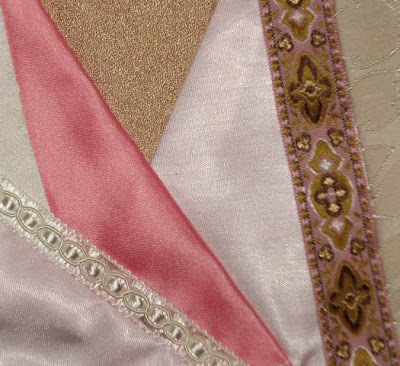 Also, the feather stitch is nice.. I think I should use heavier thread. I'm going to add lots more feather stitch here, but not sure if I should change weights of thread or not. I'll experiment. I'm pleased with my fine rouching of the silk ribbon - to the left. I find it a little dark, but the teacher said it'll blend in nice when I add more darker threads, flowers etc. I'm going to add about 10 lines of stitching this week and do several patches of feather stitch. 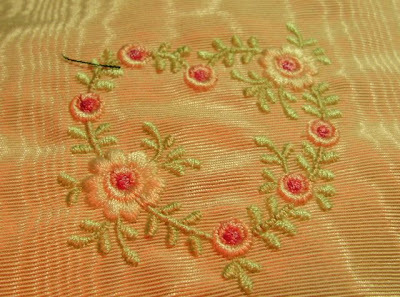 I'm also going to try to do a little cluster of ribbon flowers in the white patch in the center top. And I need to figure out what I'm going to do around my little angel to highlight her. You saw her in my stitching the angel post. 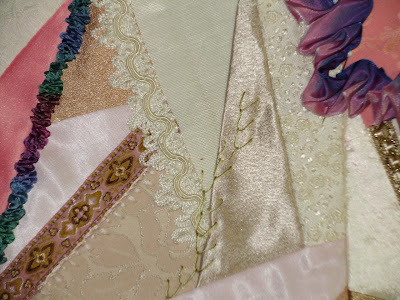 I laughed when one commenter on last weeks Crazy Quilt - Week 1 post, suggested that beading can be done right away. When we got to class yesterday, sure enough, 3 people just couldn't wait. They put beads on. It was funny. I told the class what my commenter said... they all got a kick out of it. Hey Michelle P.- do you recognize the little pink piece of fabric to the far right? 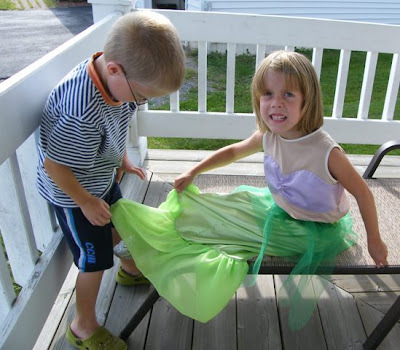 Actually Emily had a dress made out of it too. I'm glad I saved the little pieces. Well, as most of you know, Patience, my daughter, is a hairdresser. 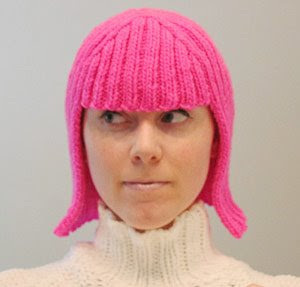 For Halloween, I'm knitting her a wig. I have it half knit, but I need a set of double pointed needles to continue. I got the pattern from Knitty.com. It's very hip. 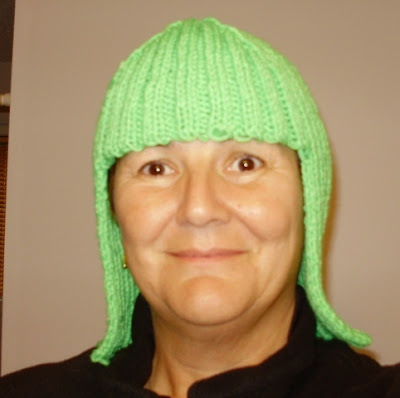 I'll be picking up a borrowed set of dp needles this weekend so I'll be able to show P's lime green wig next week. 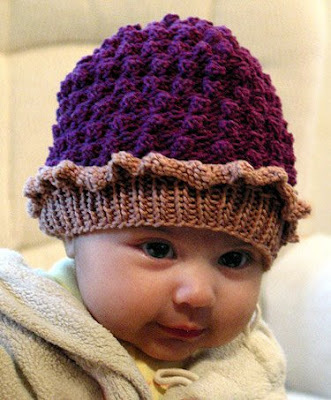 This is the picture that is on the Knitty site. Here is the link if you want to make one. The Friday girls had a day out and about Saint John today. We visited for our regular Friday coffee break with with our good friend Lee, who lives in Saint John for this 08-09 school year. 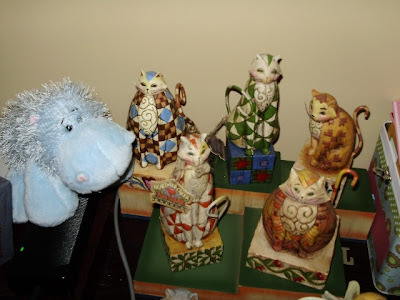 Then we all went to the KV quilt show. 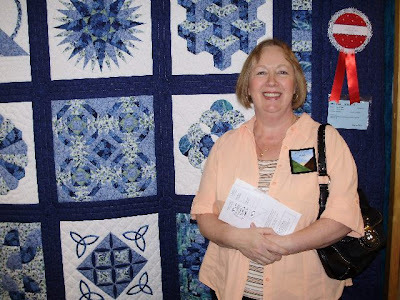 Well, Lee won a Ribbon for her Blue traditional sampler quilt at this show. It was pieced and hand quilted by her and a beautiful job, I might say. Congratulations Lee. There were lots and lots of beautiful quilts. But I saw this one, and I loved it.. It's called Nines and Vines. I've seen it before in a Scrap Quilt Magazine that I purchased last year. I have since found that it's a free pattern from McCalls Quilting website. 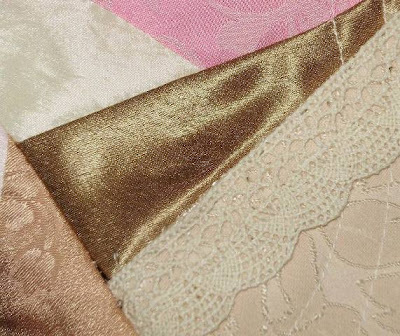 I started collecting fabrics for it last year, and lately, it's not been top of mind. 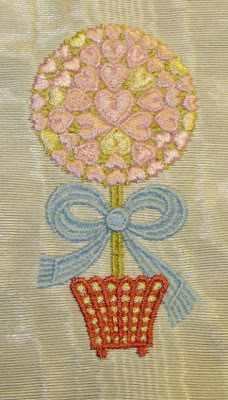 But after seeing it todayat the quilt show, I have the itch to make it.... Here is the picture that I took of it and I totally forgot to write down the name of the person who made this. I'll dig out my stash to see how much fabric I really have and if I need more to get it started. This might be a great quilt to make for the St. Dunstan's quilters. 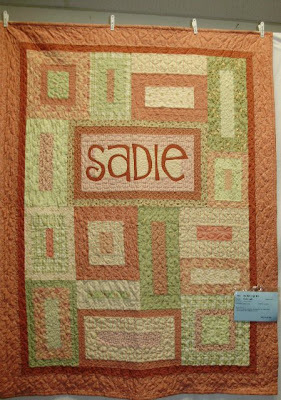 I loved this little baby quilt. I know of 2 babies going to be born in the February timeframe. 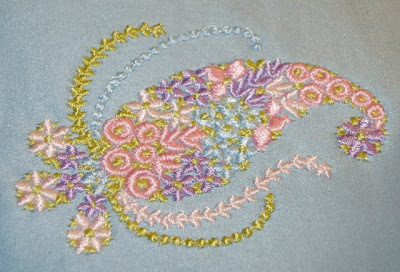 This pattern came from a Nancy Halverson book will be worth buying and I'm adding it to my wanted list. I sure hope that I know the baby's names before they're born. This will be fun. I might make a prototype for baby Aurora to see how it turns out. Lastly, I bought a few things at the quilters market. A book by Nancy Halverson - 12 days of Christmas, a bobbin holder, and a pair of Fons and Porter machine sewing gloves. In just 3 short days, I'm at 98% of my goal. I'm so pleased... Thanks to everyone who donated. You know, for those who haven't donated yet, if I'm over my goal, I get put into a special draw and I might win an extra prize for the team. I only need $10.00 to be over my goal. I'll leave this blog up for just another day or two to see if I can exceed my goal. Thanks everyone. I've been looking and looking for a great skinny picture of me to upload to my Run for the cure donation site. Well, I'm not having much luck. Could it be that I'm not that skinny! I thought of using the picture on my cute little candy box that I got in the mail yesterday... but I thought, most people just wouldn't get it. So I opted to use the photo taken during the run last year. But, now that I think of it, this isn't about me. It's about millions of women to will benefit from the research that this run will fund. New treatments, new strategies, new screening methods... it's amazing just in the last 10 years, how much progress there has been in the fight to get rid of Breast Cancer. Sooooo,,,,I'm asking for your support in this year's run. 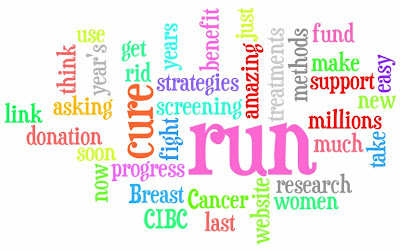 The link will take you to an easy to use CIBC Run for the cure website and a tax receipt will be emailed to you as soon as you make the donation. I was so surprized to get this little package in the mail today. It is from my sister's friend, Paula. See... last week, I helped do some embroidery on a banner that Paula is making for a trip that she is taking later this week. Paula sent a picture of the finished banner, and it is sweet... but we can't show it because she's going to enter it into the banner contest, and we don't want anyone to get sneek peek!!! 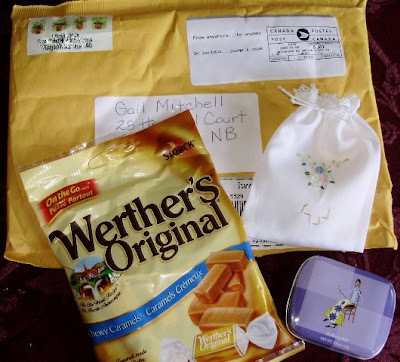 But I certainly didn't expect to get such a sweet thank-you package in the mail. 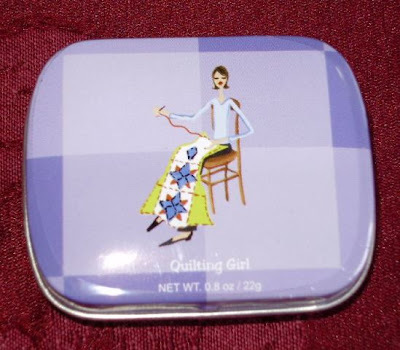 I know that my sister told her I was a quilter, and do you see the sweet little candy can... it has a picture of a quilter on it. And it looks just like me... A skinny quilter!!! Many thanks Paula, it made my day to get this little unexpected gift in the mail. Happy trails and good luck in the banner contest! So, I'm taking to finishing a few little things, that I had started, and only needed a few hand finishes. 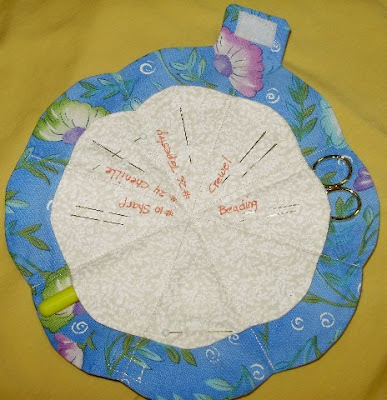 This is a needle case I made just for my crazy quilting class. 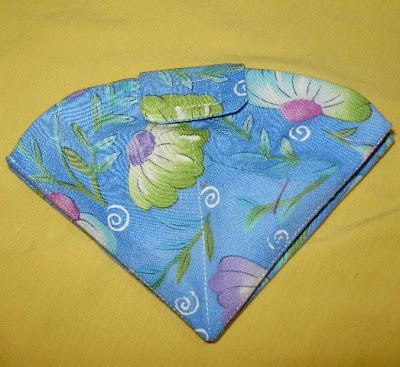 The sides fold in and it folds up to a nice neat triangle. In it , I have my specialty needs that will be used for my crazy quilting class which starts next week. The case is also small enough to put my stork scissors for clipping threads.. and I am also keeping my spider charm in it for save keeping. There is a tutorial here to make this little needle case. When I brought my Pfaff in to the shop this morning, I took my half stitched ladybug with me and asked if I could use a showroom machine just to finish stitching. Well here she is along with her friend... the blue-eyed firefly. Aren't they sweet. 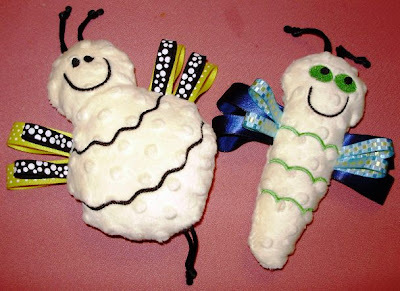 I sent a ladybug and a bee to Aunt Mae who makes craft things for their bazzar. I didn't tell her what it was... It's a surprise for her. This week I got these cute little embroidery designs to make sweet face and body details on toys. They are about 7 inches tall by about 4 or 5 inches wide...I made a prototype earlier this week and baby Aurora test drove it for us today. She loves playing with the ribbon wings and loves to chew on the rattail antenae and stinger. I had the yellow furry fabric and the black rattail already. Patience bought some funky ribbons at Michaels in Saint John. So, today after Aurora test drove the prototype, we made these baby bugs. Aren't they cute! 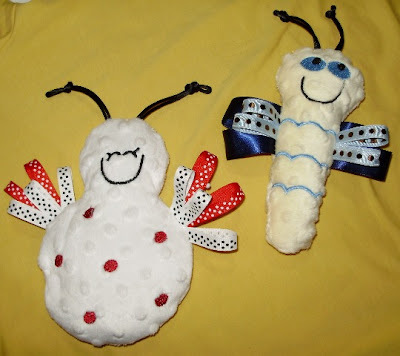 On Monday, we'll buy some white fabric and make the ladybug. She'll have red spots with red and black wings and antenae. I'm sure she'll be sweet. I'm going to make one of each and send them to my Aunt Mae who is always looking for inexpensive ideas/crafts to make for their Christmas bazzar. A couple of weeks ago, I was telling you that I was making Grace's halloween costume. 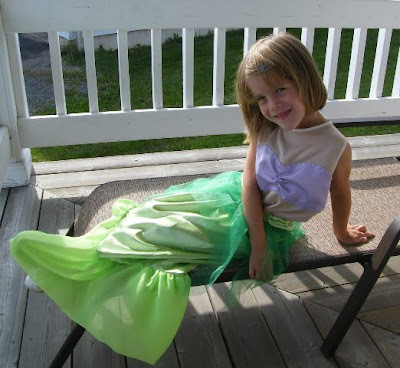 As promissed, I said I'd show you Grace modelling her Ariel costume. Ariel is so lucky to have a brother who will help her primp and look perfect for the photoshoot. As you know, Ariel is a mermaid and doesn't have feet, so Mitchell is here making sure to cover her feet for the picture. And here she is everyone. It's Ariel. 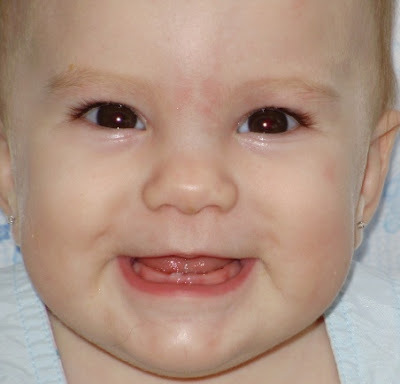 Well, Aurora is 6.5 months old and here is her first tooth. I took this picture at the cottage this weekend, then the next day, we looked and another bottom tooth popped thru. How cute. See how her eyes have darkened up.